The 2016 Consumer Electronics Show (CES) welcomed more than 170,000 attendees, the highest attendance on record. 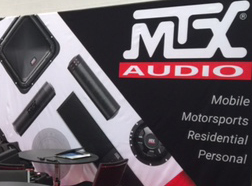 MTX was once again on hand showcasing the latest in mobile, off-road, and residential solutions designed to make you "Feel the Thunder" wherever you listen to your music. Highlights from the show included the showcase of the new S65 Series square subwoofers, new residential custom speakers, a killer Polaris RZR XP1000 Turbo, and the latest from Margaritaville Audio. Thanks to all the dealers and industry friends who came by our MTX exhibit to see our great new procucts for 2016!